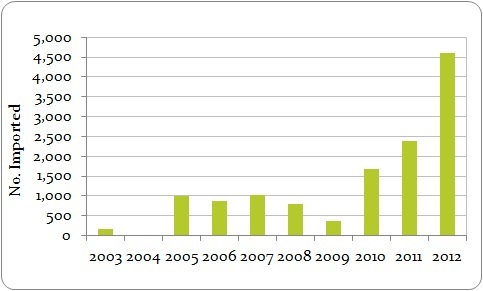 EU-reported imports of ranched Caiman latirostris skins, 2003-2012. Imports in 2012 principally comprised ranched skins imported from Argentina for commercial purposes (4594 skins). Imports of ranched skins increased more than 20-fold within the period 2003-2012, with trade levels almost doubling between 2011 and 2012. No wild-sourced skins were imported 2003-2012.